The photograph (at bottom) was taken in March 2017, but part of it … the furry part …. could easily have represented yesterday! We were out on our regular “Ray walk”, and he seemed quite disappointed with his normal “treat stops”. Lululemon’s dog biscuit bowl was empty (and the staff were obviously busy), and the bank was closed. Ray, in true Ray fashion, took it upon himself to resolve the problem and took charge of his walk. He was clearly on a mission! We could only speculate where he was taking us as we headed out of our downtown area. We were going in the general direction of home (so we weren’t concerned), but it was not the usual route home. We soon worked out that he was heading for a particular dog food and supplies kind of store where he has been given treats on earlier occasions. He was successful. From that store to home, we decided to cut across a park which has an arena on one side of it. I hadn’t really thought about it until then, but that arena would have the ice down by now. After the ice machine (Zamboni) has finished grooming the ice rink, it goes outside to dump the fine shavings (looks just like regular snow) that were scraped up. At about the same time that I saw the pile of snow, Ray was climbing up onto it and then burying his head and rolling in it … which is exactly what he was doing in the photograph! Winter is approaching quite fast, and Ray would seem to be ready for it! 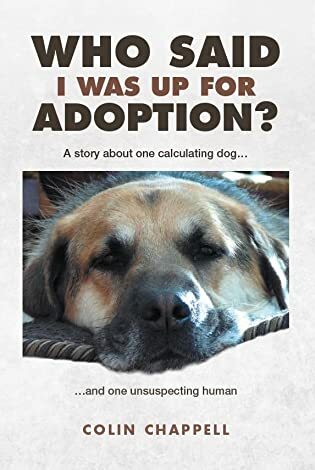 For more information about Ray, specifically the first 18 months of living with him, please click/select the book cover of “Who Said I was up for Adoption?” in the right column. All net profits from book sales will be directed to the Oakville & Milton Humane Society, who initially rescued him and worked with him for four months before considering him suitable for adoption! I LOVE Ray’s enthusiasm. That characteristic comes out clearly in the book. Who Said I Was Up for Adoption has many “Ray” moments arranged in chronological order from first coming home to his adaptation to adoption which makes for a fascinating read! Thank you Rae. He really was (and still is) a fascinating subject to write about. Great picture Colin. Ray’s having so much fun. You are another Sunshine Blogger Awardee by proxy as I believe your blog is award free. Good for her. Ray does not have the beach option per se, as our lake edge is millions of small flat stones. We have to be careful the razorfish shells don;t cut into her feet. The thing about animals is that they are single minded. First, get that treat. Next look for wonderful opportunities to play! Check, check! My girls love the snow too. They seem impervious to the cold. Hope to see at least a few snow days at the Golden K this year. He’ll be up that ice wall and away with the wildlings, the scamp. Humans, they know nothing ’bout snow. Love that! Ray clearly enjoys the snow. We had our first storm last week and the pups were frisky as all get out and while they didn’t roll in it, both noses were full of the white stuff. I think everyone needed coaxing after this summer!